The Lamborghini Gallardo LP570-4 Super Trofeo Stradale is one of the rarest Gallardos ever built. There are just 150 in the entire world. But one of them has been seen in the parking lot of a Texas High School. And even more surprisingly, it is allegedly being driven there by a 15-year old girl with a license granted to people that are in economic hardships. This scene takes place outside Dallas, Texas at what looks to be Coppell High School. The car is the Gallardo STS, which is one of the rarest Gallardos ever made. Based on the cars used in the Super Trofeo racing series, there are just 150 on the roads worldwide, and they are basically hell on wheels. Redditor celli_ says that the car came to their school with a 15-year old girl at the helm. But you don't get a license in Texas until you're 16. So how would it be legal for her to drive it? And, more importantly, who lets a 15-year old drive a Lamborghini? 1. The applicant's family faces an unusual economic hardship and is being deprived of the basic necessities of life. 2. The applicant has an ill family member who needs transportation to medical treatment or the applicant must drive in her place to keep the household running. 3. The applicant is enrolled in a vocational educational program. 4. An immediate family member has died and remaining family members need him to drive temporarily to carry on household routines. My parents asked me if I wanted a hardship license. They asked me because all of my classmates were getting hardship licenses. The law in my state had just changed from 15 to 16 for a driver's license. Roughly 80% (conservatively) of the kids in my class got hardship licenses because of the recent change from 16 to 15. I told my parents that I refused to get a hardship license. I waited until I was 16 because I read the law and I understood the reasoning behind it. I went to a private school where kids in my class pulled up in their brand new mercedes/bmws/porsches/range rovers on their 15th birthdays. That is not within the spirit of the law behind the hardship license. You either need a license at 15 to support your family or you wait until you are 16. So it doesn't really sound like a challenge for someone to start driving at age 15 in Texas. But shouldn't it still be a challenge to get in a Gallardo? And what sort of hardship is it to actually get in a Gallardo? With just 150 of these Gallardos in the world, it shouldn't be too hard to find out some information on this particular one that is gallavanting around the Dallas area and debunk this story. We called Top Speed Auto, as their name is on the car, to see what the deal was. Top Speed told us that this particular Gallardo belongs to a friend of the owner of the company. He doesn't have a 15-year old daughter, but he does have a 19-year old son — who is an accomplished driver — that drives the car from time to time. Top Speed said that is the youngest person that they know of that is driving the car. The concern is that someone younger might be driving the car. This Gallardo is used by Top Speed as a promotional car and an R&D car, so even though they don't own it, they do know who is typically driving it and where it is. Top Speed also told us that having cars like this at a high school isn't unheard of. They told us they've heard about kids with Ferraris, Porsches, and other exotics that kids don't normally have at high schools in the area. The big difference is that they aren't involved with any of those cars. That actually leaves us with more questions than answers. If a 15-year old girl was actually driving it, who let her? Did the 19-year old let her drive the car for a little bit to impress her friends? Or is the Redditor full of crap? Or perhaps it's just a combination of all of the above. (UPDATE: In an amazing twist, it appears the Redditor is actually not full of crap. We just spoke some more with Top Speed, who told us the man with the 19-year old son doesn't own the car, but is the owner's driving instructor. The man who owns the car has a girlfriend with an 18-year old son... and a 15-year old daughter. The Gallardo was in storage at Top Speed almost all summer until earlier this week when it went back to the owner. 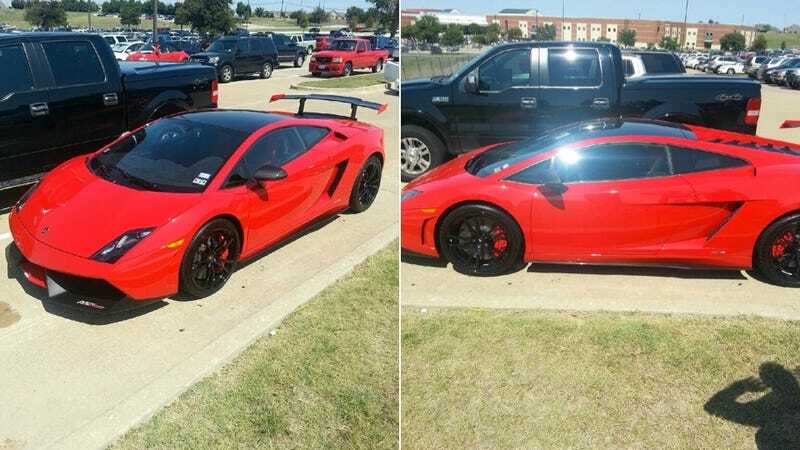 It has been confirmed to Jalopnik that these pictures were indeed taken at Hebron High School in Carrollton, TX, not Coppell High School as we originally thought, and they were probably taken yesterday.